Resole your own. 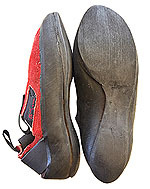 High friction, hard wearing soles, glue & detailed instructions for redoing your gym, bouldering or trad climbing shoes or turning any approach shoe or kids shoes into a casual climbing shoe. Replace your soles before wearing through the sole or rand that encircles your shoes and damages underlying structure. STEALTH C4 RUBBER will improve the grip of any shoe. If you are handy and have some basic tools (knife, sandpaper, pliers) and are patient you can do a respectable job. Over achievers will make good use of tin snips, clamps and a belt sander. 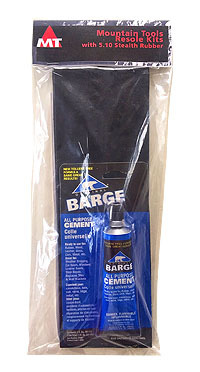 Complete step-by-step instructions, slab of 4.2mm C4 and non-toxic Barge Cement are included. Not as shown.